Donald (born 9 June 1888) and his siblings Alexander (1879), William (1880), George (1882), Isabella (1884), John (1886), Jessie (1890) and Mary (1893) were left orphaned following the death of their father through suicide in September 1894 (prompted by grinding poverty), and the death of their mothe on Christmas Day 1894. The children were taken in by the Quarrier Homes in Bridge of Weir, Renfrewshire, who emigrated them to Canada in 1896. The girls went on one ship, the boys on another. Each was adopted by a separate family in Ontario. 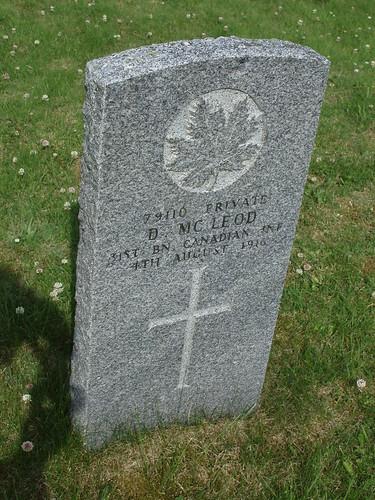 Donald joined up at Calgary and lost his life in the war. His remains were erroneously transferred to Benbecula, but when his coffin arrived for the attention of the relatives of a Donald Macleod in Gramsdale, that man's family had just that day had confirmation that he was still alive, so they refused to take charge of the coffin. It was finally interred a week later at Nunton as Commonwealth War Dead. Donald Macleod from Gramsdale, Benbecula, survived the war and died in 1952.